Billy Gilman — "The Voice" sensation and singer of the hit single "One Voice" — will sing the National Anthem before the start of the Folds of Honor QuikTrip 500 on February 24. Before dazzling millions and earning a runner-up finish on "The Voice", Gilman burst onto the national stage in 2000 with his hit single "One Voice." His debut album was certified double platinum in the United States, and he was included in the Guinness Book of World Records for being the youngest singer to ever reach #1 on the Billboard Top Country Album charts. Gilman has sold five million albums worldwide and garnered awards and nods from the Grammy's, Academy of Country Music, the Country Music Association, Billboard Magazine, and the American Music Association. 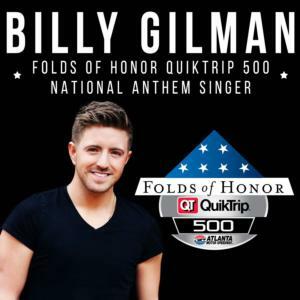 "Nothing tops the excitement of a NASCAR weekend and performing for NASCAR fans," Gilman said. "I'm honored and excited to be performing the National Anthem before the action begins at Atlanta Motor Speedway!" NASCAR returns to Atlanta February 22-24. To purchase tickets today, call the AMS ticket office at 877-9-AMS-TIX or visit www.atlantamotorspeedway.com.